4 stars for this epic battle for supremacy. 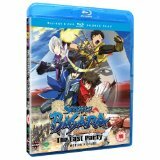 Sengoku Basara Samurai Kings Movie: The Last Party is one hell of a title for a film to have to live up to. And yet somehow they have managed it. This is based on the popular TV series, Sengoku Basara Samurai Kings and is set in the Sengoku period of Japan, when rival generals fought in endless battles for power and ultimately unification of Japan. We begin as Ishida Mitsunari (subordinate of Hideyoshi) begins a killing spree, targeted at Date Masamune in an attempt to avenge his master. At the same time, Ieyasu Tokugawa seeks to unite the other warlords under a banner of peace and begins to bring them all together for the first time. Love the review! Sengoku Basara is excellent.